Travel often? Use Google Street View? Hell, maybe you'll love Virgin America's Seat View. It's exactly what it sounds like: You use the campaign to "stroll" through the Airbus A320 that flies out of all 22 destinations Virgin America serves. Nervous about the leg room in coach? Check out Main Cabin Select. Or wander right past the partitions into First Class, though sadly you won't be able to try the built-in lumbar massagers. And it's not just online—you can try Seat View from bus shelters in six markets, too. The work results from the insight that some U.S. airlines use ad campaigns to highlight amenities that aren't actually available on all flights, says Abby Lunardini, Virgin America's vp of brand and communications. 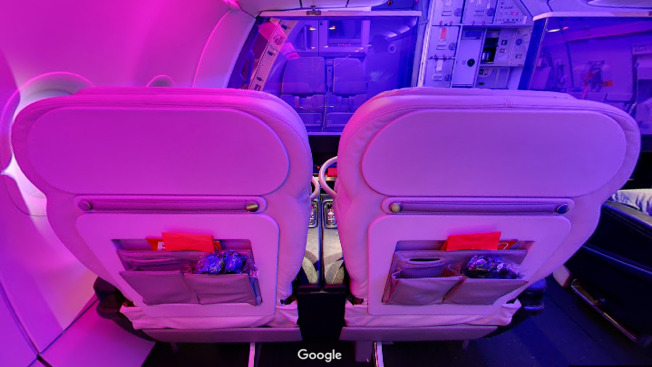 "For travelers who may be new to Virgin America, the Google Street View experience brings our product difference to life in an authentic way," she says. "There is no bait and switch. Flyers can tour the actual product they'll fly on when they book us from any of our cities—just like they experience the rest of their world via Google Maps." 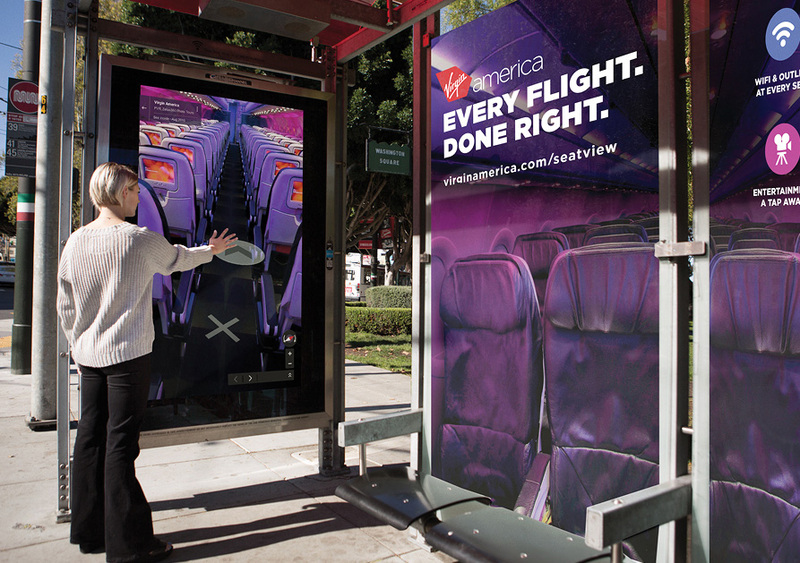 Seat View was made with help from agency Eleven and Google Street View, making Virgin the first U.S. airline to incorporate Street View technology into an ad campaign (though we didn't realize there had been a race). Its subsite is supported by digital banner ads and includes a quick description of each cabin class, followed by the option to book any of its current routes. If you live in San Francisco, New York, Los Angeles, Dallas, Washington, D.C. or Chicago, you might also run into an interactive bus shelter, which gives you a nicer sense of real-life scale. "People have increasingly come to rely on Google Maps and Google Street View to explore their world," says Google Maps Street View program manager Deanna Yick. "We hope launching this Street View imagery will help better inform travelers of what they can expect, and to see Virgin America's award-winning cabins." We dig that. The one big setback to the campaign is that it forgets to what degree flying is a tightly packed, intimate experience. Being able to zoom in on Virgin's "amenities"—like the outlets available at every seat—would be useful, too. Street View's technology was meant to give you a general sense of much bigger spaces, like, well, streets—so usability isn't really adapted to digging around and getting a closer look at things. That would really help frequent travelers get a jump-start on their trips: The one thing we all do, just before buckling up, is run a quick inventory of everything we have access to, to maximize entertainment for minimum movement. So, maybe there's a reason no airline has ever used Street View before. But let's be optimists: Maybe this use case will help Street View optimize for instances when people need more granular details about what they're about to buy, versus a general sense of what other big items are around—a perk that isn't as useful as Virgin thinks. Frankly, zooming in on the TV on somebody else's seatback tells us absolutely nothing about how our legs will feel once seated. Cool mood lighting, though.